Photos are attached for media use and IDs are: Top Row (L-R): Gavin Gould, Sarah Landeros, Mackenzie Sise, Sabrinna Gonzales, Kendra McKinley, Brett Andrade, Victor Lumidao, Austin Castro, Beto Franco. Bottom Row (L-R): Alexis Gerardo, Derek Tristao. 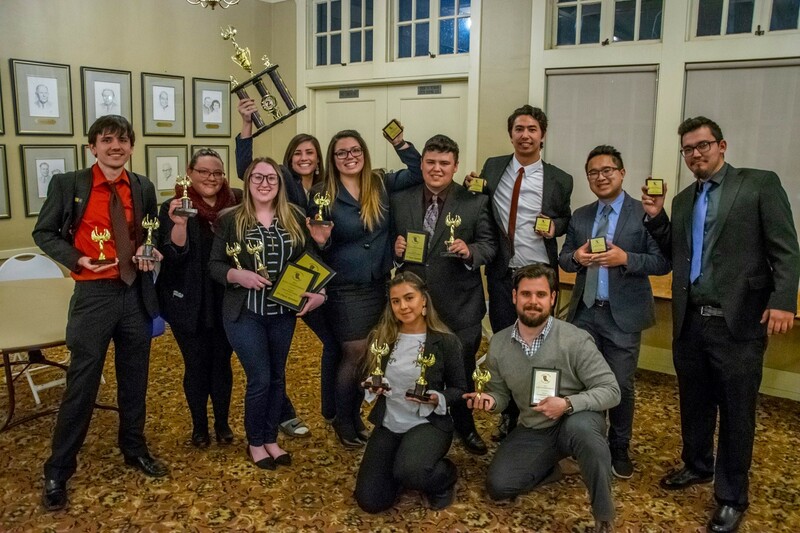 (MODESTO, CA)—The Modesto Junior College speech and debate team took the second-place overall sweepstakes award at the Northern California Forensics Association regional championship on February 22-24 at University of the Pacific. MJC competitors racked up their sweepstakes points with impressive personal wins in individual and debate events. In individual events Alexis Gerardo and Kendra McKinley took second and third place in open informative speaking. Gavin Gould took second place in novice extemporaneous speaking. Austin Castro was a finalist in open extemporaneous speaking. Victor Lumidao and McKinley were finalists in open communication analysis. Beto Franco was a finalist in novice persuasive speaking and Lumidao was a finalist in open persuasive speaking. In debate events Mackenzie Sise took a finalist award in novice Lincoln-Douglas debate and was the top speaker in her division. In novice Parliamentary debate, the partnership of Derek Tristao and his hybrid partner from City College of San Francisco took a quarterfinalist award. The partnership of Gerardo and Sarah Landeros took a semifinalist award, as did the partnership of Brett Andrade and Sise. In open Parliamentary debate, Gould and his hybrid partner from Solano College took a quarterfinalist award. Tristao, Andrade and Sise were also recognized as the ninth, seventh and second place overall speakers in novice Parliamentary debate. On March 13-17, the team will travel to the California Community College Forensics Association state championship. For more information about the team, including travel schedule and results, visit www.MJCForensics.org.